Be welcomed into the delicious comfort and tranquility of the new Plantation Teak Club Chair! The Plantation Collection evokes a sense of colourful, tropical destinations like Jamaica, Africa and Indonesia. 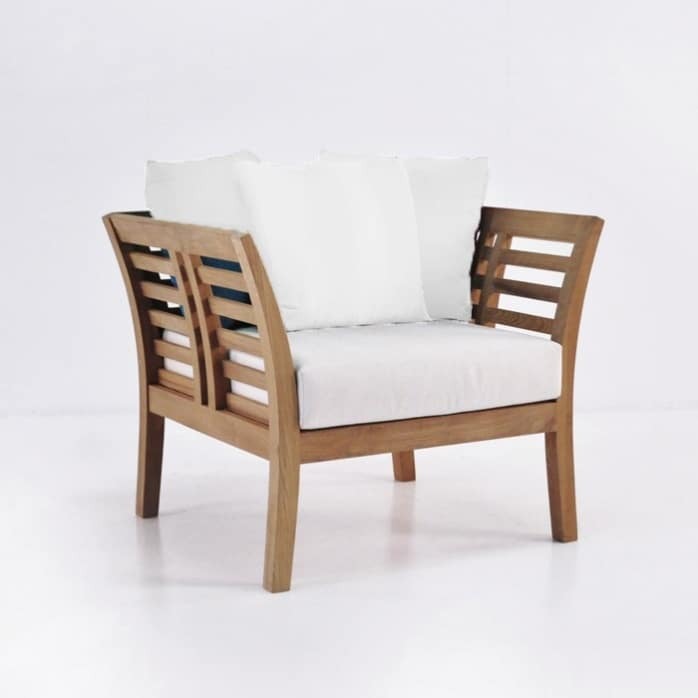 Simple, stunning craftsmanship highlights the refinement of the Grade A Teak, and the genius of the Plantation Club Chair boils down to the precise placement of beautiful slats of wood, cut exquisitely to flare out at the top; creating an assuring and welcoming look ready for you to flop into! Our Plantation Collection is constructed using the highly sought after Grade A Teak, bolted together with marine grade stainless steel and made comfy with the plush, cushy Sunbrella® cushions filled with long lasting Quick Dry foam. The Plantation Teak Club Chair comes with FREE Sunbrella® cushions!